For Anna Rosti and Andrew Morris a 'quick drive' was the start of building their first home together. The young couple are among a wave of new residents who have bought into the fast-growing Gainsborough Greens community on the northern Gold Coast after it posted its 2000th settlement. 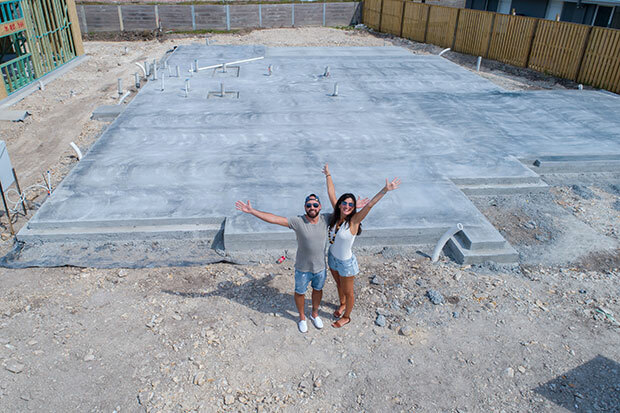 Ms Rosti said within a matter of days of visiting Gainsborough Greens in Pimpama for the first time, the couple had purchased a homesite and started making plans for their single-story, four bedroom home, which they will move into in early April. “We had been searching for a block of land to build on and had visited a few other areas, but immediately fell in love with the natural, tranquil and calming surrounds at Gainsborough Greens,” said Ms Rosti. “Building at Gainsborough Greens was the ideal option for us as I work on the Gold Coast and Andrew works at Yatala, so the combination of location and affordable pricing was a big draw card, and we didn’t have to skimp on one or the other. Ms Rosti said the couple will make the move from their apartment in Southport to live in their dream home, built by Ultra Living. “We custom designed our home and the process was very easy and professional," she said. The 2000th settlement came in record time for Gainsborough Greens, which is being developed by Mirvac, with the first 1000 sales at the community taking seven years to complete and the second 1000 just 18 months. Mirvac Queensland Residential General Manager, Warwick Bible, said the community was welcoming new residents each week, with building underway on literally hundreds of new homes. "To reach 1000 settlements in just 18 months is testament to the popularity of Gainsborough Greens and the wider Pimpama region with a diverse range of purchasers, from young couples and families through to empty nesters and retirees,” said Mr Bible. "The feedback from our residents is the significant value on offer, abundance of parkland and location close to the motorway - making for an easy to commute to either the Gold Coast or Brisbane - positions Gainsborough Greens as the ideal place to live. "The newly-opened Westfield Coomera Shopping Centre has also added to the fast-growing mix of infrastructure and amenities, including sought-after schools, accessible to those who call the community home."